Although my family is relatively small, with our active schedules we're really lucky on occasions when we get (almost) everyone together. Last weekend, with eleven for dinner (the whole family minus my niece), we celebrated a hodgepodge of milestones. My septuagenarian mother's safe return from a "post-revolution" tour of Egypt (which followed her "pre-revolution" tour of Libya in December -- I kid you not). My birthday. My niece's handing in her senior thesis (on micro-finance in India). Easter. My mother's birthday. And, bon voyage (Mom's packing her bags for Berlin and Jim and Wendy are headed to Jamaica). In planning the menu, I wanted something crowd pleasing, easy and inspired by my mother's North African travels of late. I made Cornish Game Hen (Le Petite Poulet) with Preserved Lemons and Orange Blossom Water using local and sustainable hens from Epicurian Farms -- fragrant, tender, delicious. I served the meal with homemade mint tea, Sauvignon Blanc, a tossed Mediterranean chopped salad, toasted pita bread and hummus, grape leaves, Armenian string cheese, Moroccan olives and couscous. I added raisins to the couscous water before cooking and tossed a handful of toasted almonds after the couscous was cooked. The only thing missing from this Arabian feast was the belly dancers! 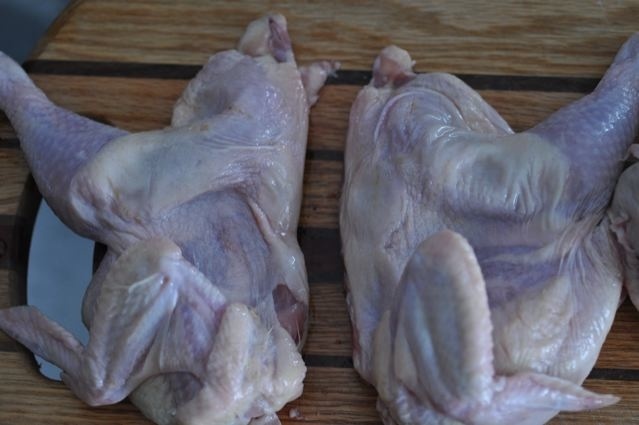 Clean and dry hens and cut in half down the middle. Prepare onions and garlic. 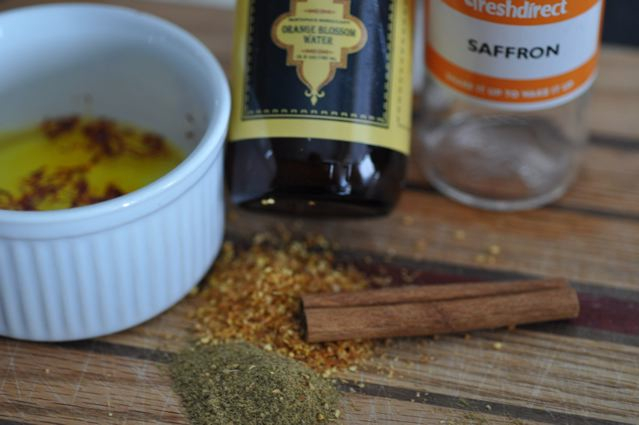 Place spices into a small bowl or ramekin (saffron, orange flower water, cumin, orange rind, cinnnamon). 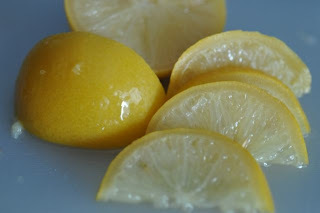 Cut preserved lemon into 8 wedges. Heat olive oil in a Dutch oven or pressure cooker. Saute onions and garlic until translucent. Brown the Cornish game hens. Add the spice mixture, preserved lemon and chicken broth to the pot. Cover and cook for about 1 hour and 15 minutes over medium heat until the meat is falling off the bone (I used a pressure cooker on high for 11 minutes). Remove birds and set aside. Strain the braising liquid and reserve. Return the strained liquid and hens to a pot and reheat when ready to serve. 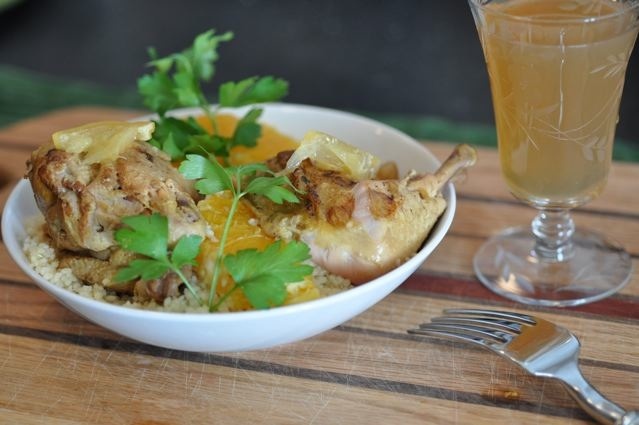 Serve with plain or seasoned couscous. Garnish with oranges and parsley to add color. Boil water for couscous. Add raisins and couscous, cover and turn of heat and let sit for 5 minutes. Stir in toasted almonds and serve immediately.